If you’ve ever fished on a Mexican ponga you may have noticed the essence of simplicity as far as bait pumps are concerned. The tank itself is the bilge area between the seats. The pump is the ponga captain who uses a scoop made from a bleach jug to bail out the old water and refresh with some from right over the side. No shafts to break, no electrical to corrode, no frustrating airlocks; the setup is about as trouble free as it gets. For the rest of us it gets a bit more complicated. 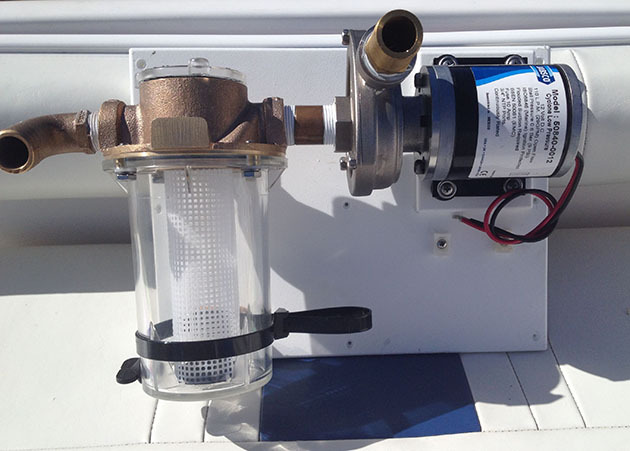 When I first started fooling around with boats and bait tanks we had virtually nothing to choose from as far as small dc pumps were concerned. Back in the day Elk Brass was the pump of choice. 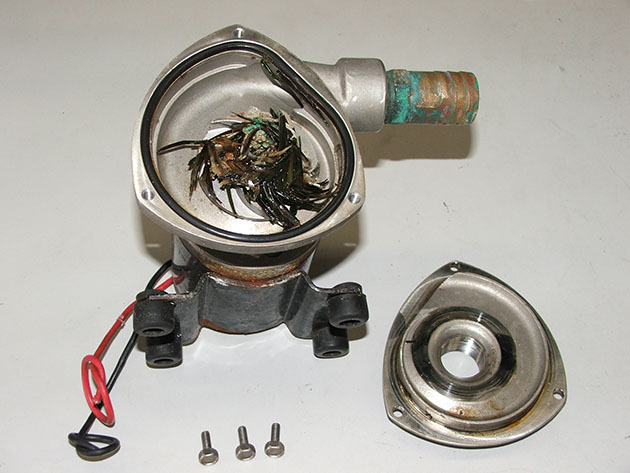 They had a small sewing machine sized motor and the shaft of the motor was connected to the shaft on the impeller with a short section of 1/4” hose. They worked ok as they were very quiet and had a low amp draw but there was one major issue; that little hose would often slip so the motor would be running but not pumping. I can’t begin to remember all the trips I would lay on a wet deck in bad weather to swap out a bad pump. As the years have rolled by the selection of bait pumps has increased exponentially, right along with our knowledge of how to install them. For a long time the pump of choice was the venerable Jabsco Water Puppy. Part of the reason they gained in favor was they are “idiot proof” in terms of installations. They are self-priming so they can be mounted almost anywhere, turned on, prime instantly and start to fill the tank. Now on the surface that sounds like a great deal except for the fact Water Puppy pumps are noisy. They create the necessary suction by rapidly spinning a rubber impellor in a tight fitting, specially shaped housing and the process makes noise…lots of noise. Fortunately today we have many other choices. From time to time we do run into installations that require a self-priming pump. 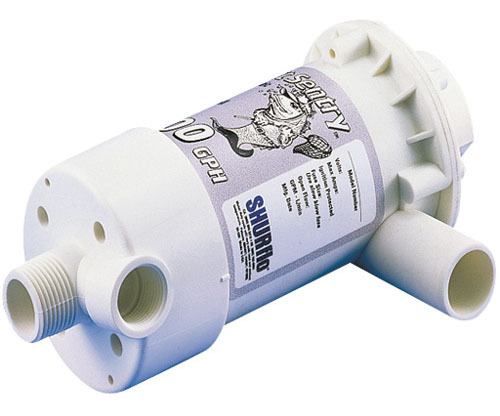 Today we’ll use a BaitMaster from Shurflo when facing a situation where the normal centrifugal pumps we use just won’t work. Sometimes it is a space restriction and sometimes we need to overcome excessive head pressure. Either way the BaitMaster’s do a decent job. They are a diaphragm pump, quieter than a rubber impeller pump but still noisier than the ultra-quiet centrifugal pumps we prefer. 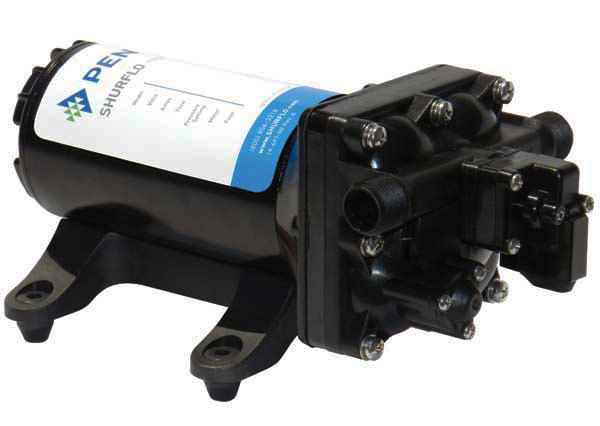 For the vast majority of installations the newest generation of small, low amp draw and water proof plastic pumps work just fine. They are easy to install, inexpensive and come in three sizes (500, 800 and 1100 gph) which accommodate many sizes and styles of tanks. We use them extensively and if properly installed will do a fine job within their limitations. 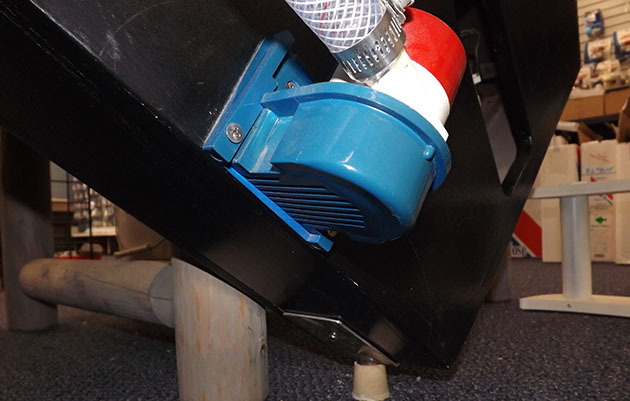 At the simplest the small, round bilge pump style fit into a specially designed blue bracket to make an easy solution to what used to be a difficult situation… how to put a pump on a boat without using a thru-hull. But like anything technical they must be installed properly. The leading edge of the blue bracket must be installed flush with the bottom. 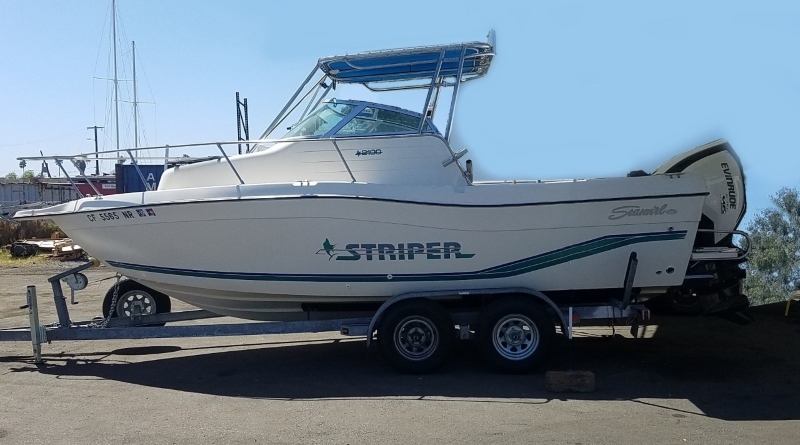 I’ve seen many just screwed on the transom haphazardly and the owners wonder why they get water when they are at the dock but not when underway. 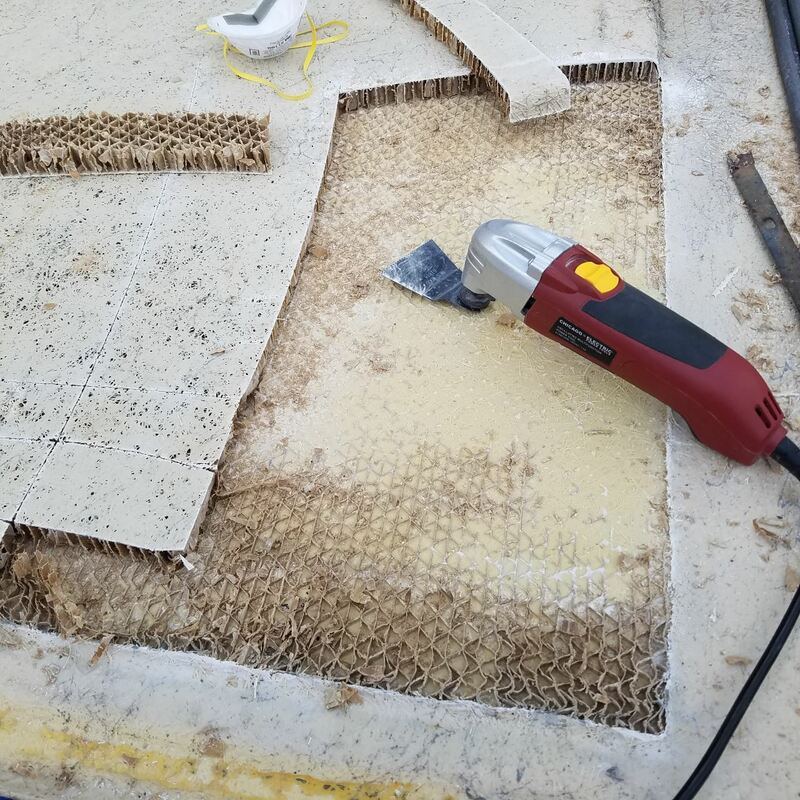 Position it about 12” to 18” out from the keel, away from any other thru hulls or lifting strakes and with the hose outlet on the high side is about all you need to know for a trouble free installation. 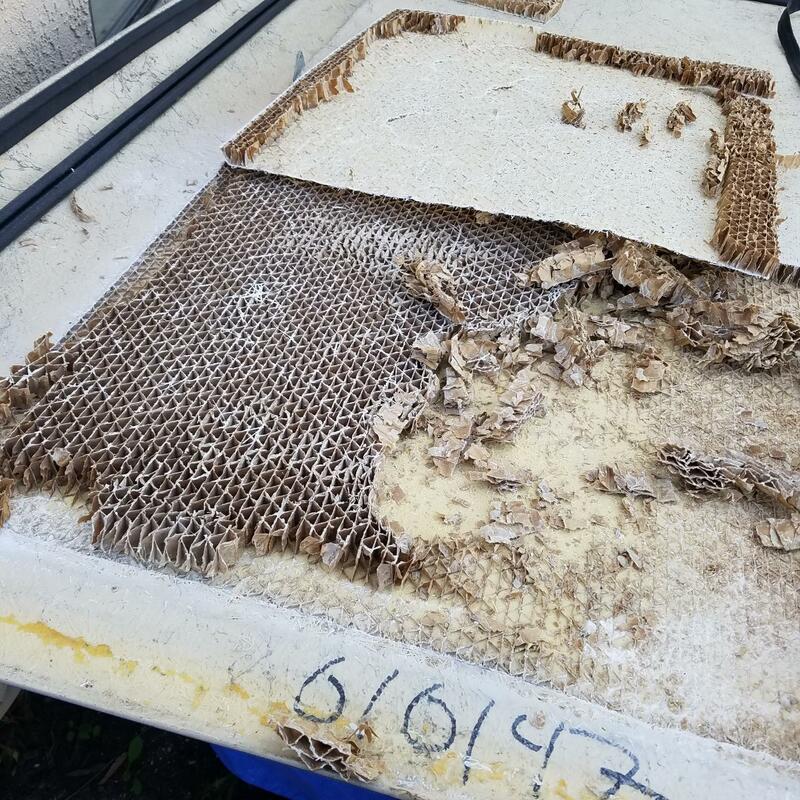 The best installations are based on a centrifugal pump, a bronze thru hull with a high speed pickup and a sea strainer to filter out eel grass, cigarette butts and crumbled Styrofoam. The bigger pumps we use are far more tolerant of bits and pieces of junk in the water but the smaller units can suffer mightily. The strainers we use are about $160 and the extra fittings can push it north of $200 in parts only but it is well worth it. A recent installation showing a sea strainer and a Cyclone on a mount ready for installation. The new series of Rule Tournament pumps have done a pretty good job these past few years…with one major exception. They did have a bad batch of pumps this past summer and it did cause some chaos. 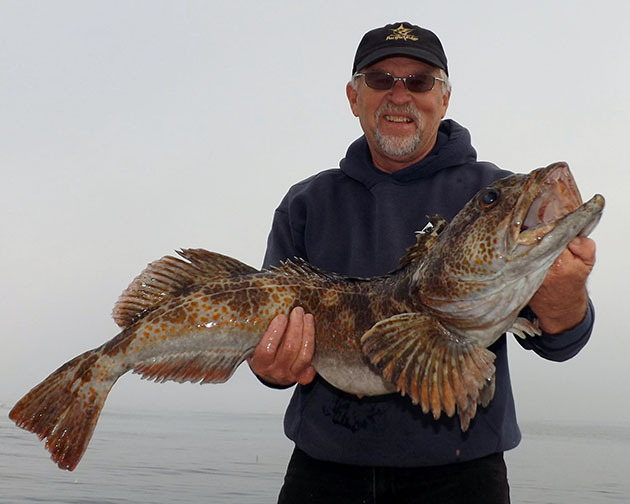 When you’ve got the best fishing SoCal has seen in many years in conjunction with a bunch of pumps that would fail within a day at times it caused some hard feelings. Fortunately it looks like the bad pumps have been cleared out and we’re back to normal again. One of the features I like about the Rule pumps is the ability to easily swap out the motor cartridges. The new ones have a far better locking mechanism so they stay together which is obviously important for peace of mind. 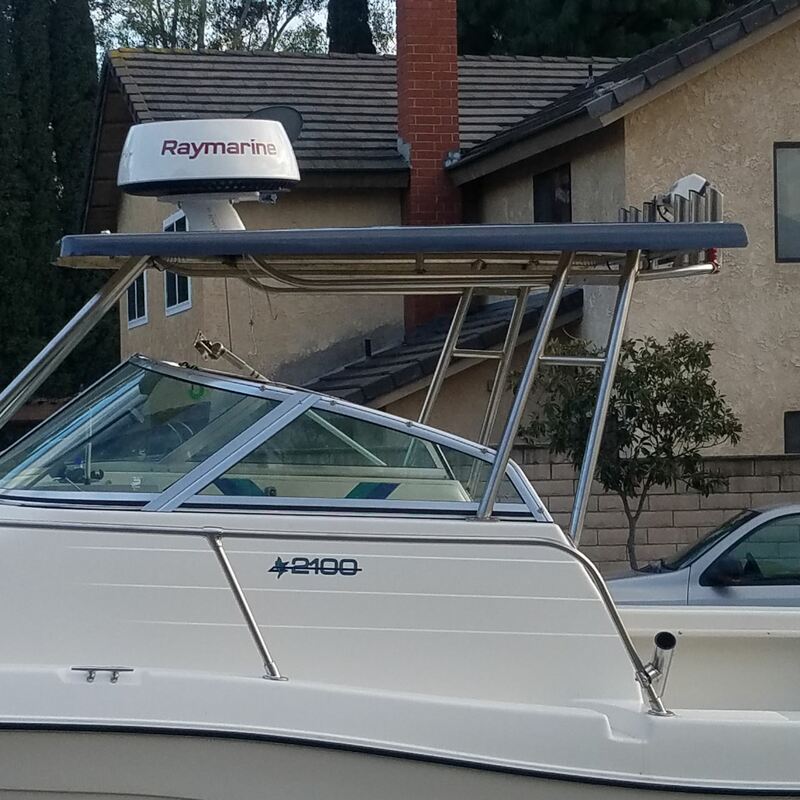 With a little advance planning a boat owner can set up their system be very user friendly when it comes time to swap out a motor. If you’re at the dock with no water in the tank it’s no problem. But it’s my experience the issues are more likely to happen in the dark on a cold rough night. But if you’re ready it’s far less an issue. 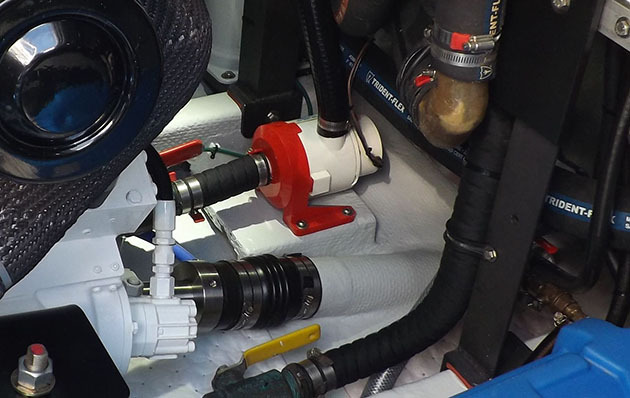 One of the most important upgrades needed is a ball valve between the tank and the pump. When you shutoff the valve on the thru hull and the valve above the pump you’ve isolated the pump and your bait water stays in the tank when you pop out the motor cartridge. If you’ve also set up the wire connections with quick-disconnects then this motor swap can be handled very quickly and you’re back in business. Don’t forget to re-open the valves, double check that the cartridge is locked in place and test for leaks. On boats other than outboards it’s far safer to shut down if the pump is anyplace near belts, pulleys or moving parts of any kind. The Rule pumps are very popular and very quiet. But another viable player is the Bait Sentry line of pumps from Shurflo. They are similar to Rule pumps in that they have a plastic housing and are very water resistant. 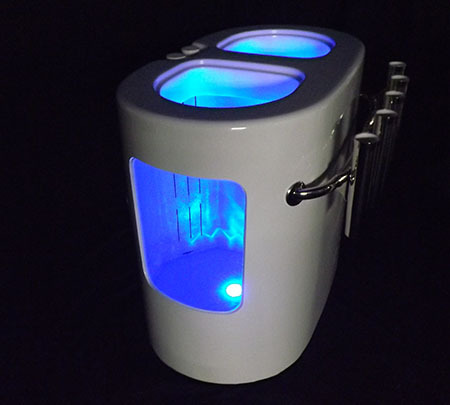 They also come in similar sizes (500, 800 and 1100) and have a low amp draw. But beyond that they are very different designs. They don’t have the cartridge feature; if you have a problem you unscrew one and screw in another. 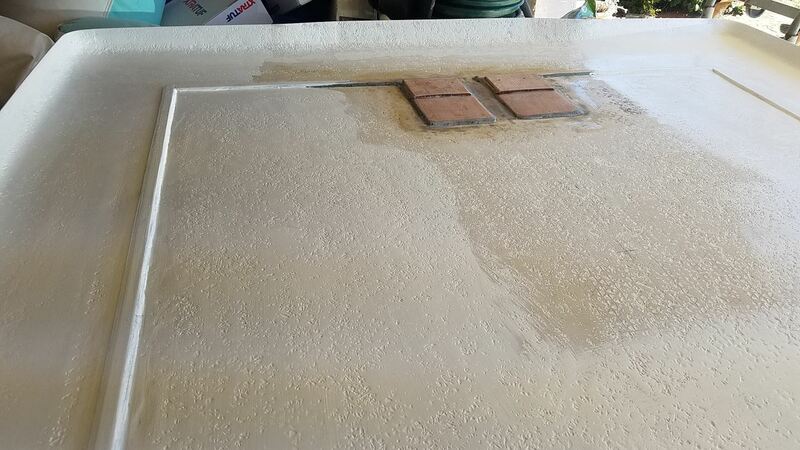 One good feature is there impeller is not shaft driven so there are no issues with electrolysis. The impellers are magnetically coupled to the motor which works fine as a drive mechanism but because there is no direct connection the impeller does rattle around some. It’s not “noisy” but they are not silent either. I think size for size they also pump somewhat more water than an equivalent Rule. There are many more of these smaller pumps on the market but these two are the major players and we’ve had good success with both. But when it comes time to kick it up a notch you are getting to a different category with a bigger price point and different features. 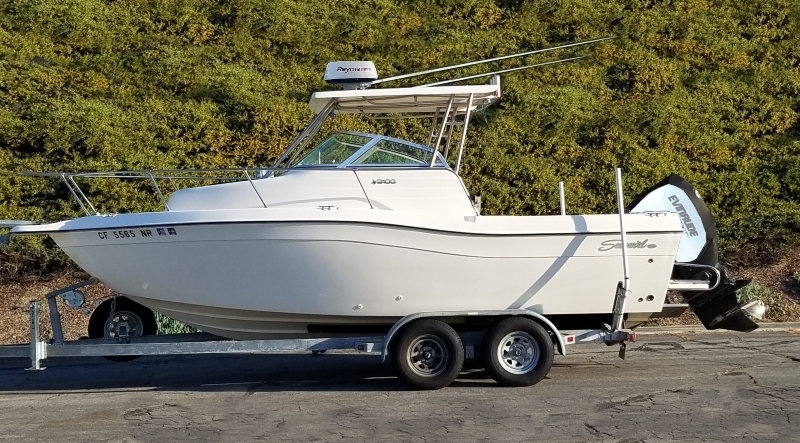 For customers needing more bait water and having a dry location for installation we use the Jabsco Cyclone for many installations on tanks in the 60 to 100-gallon range. These are great pumps with both a stainless steel pump housing and impeller. They do draw more amps (about 8) than the smaller pumps but they move a lot of water. The thread size is ¾” npt and if you use hose barbs that are ¾” pipe to 1” hose and use 1” hose they work fine on tanks up to 100-gallons. There are a few more pumps in this size range but the Jabsco has been the best for us. Groco and Aqua Tiger are not my favorites. Oberdorfer’s are good but hard to get. The Rule 1600 tournament series is prone to airlocks. For bigger tanks it starts to get more complicated. There are not many dc pumps capable of handling tanks over 100-gallons so we’re limited to mostly just one, the Rule 3700 general purpose pump. These pumps do draw more amps (about 15) but the move a huge amount of water. On the Pacifica 44 I was running a few years back there were three 90-gallon tanks and our 3700 could run them all. So for tanks in the 120 to 200-gallon range they may have to be somewhat restricted depending on the design of the inlet system to the tank. To get maximum flow rates these pumps require much larger plumbing. A normal Installation has a 1-1/2” thru hull. Then I use a 1-1/4” strainer with 1-1/4” pipe to 1-1/2” hose barbs and 1-1/2” reinforced hose up to the manifold. 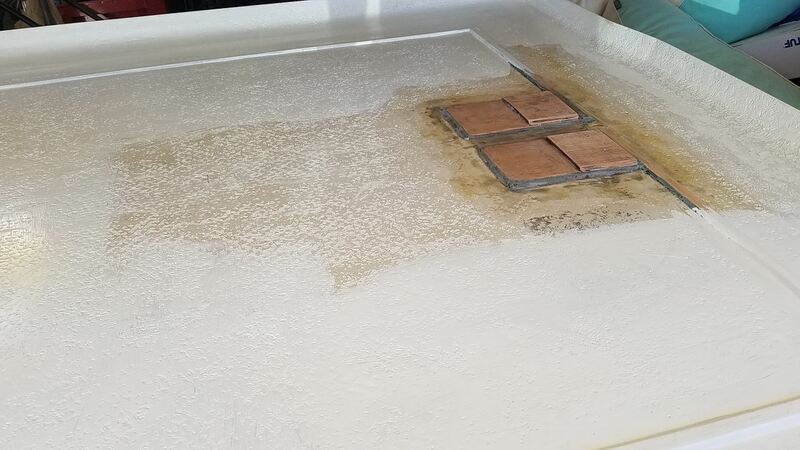 This insures you’ll get the maximum flow to keep bait healthy and happy in your tank. For boats wanting back-up we put in two complete pump setups with separate thru hulls and strainers. Within the next day or two we’re going to have our next brand new tank; the PE-170-D. 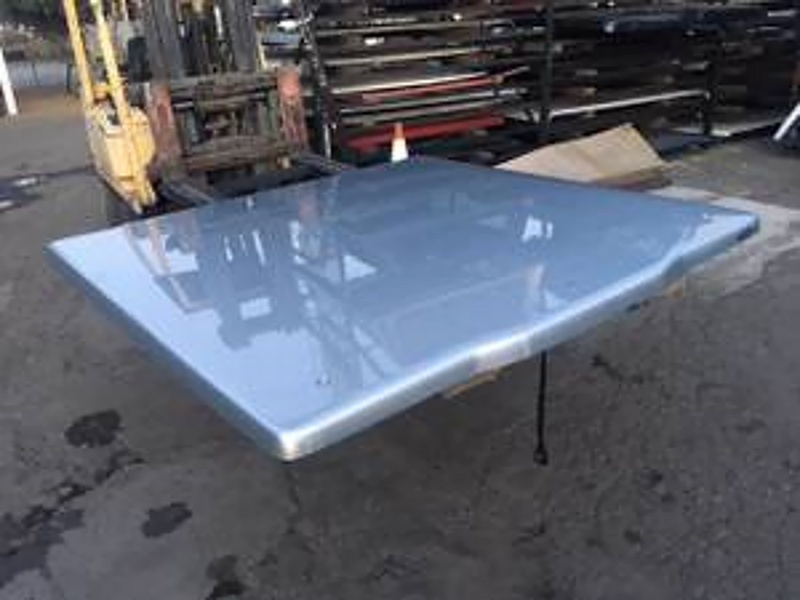 Right after the first of the year we had a customer call wanting a big double tank for his 47′ Riviera and we had the option of stretching an existing 140 or making something new. Since I love designing new tanks and we had sufficient time I opted to build the new tank and add another model to the lineup. The new 170 is a double tank, 85-gallons per side, and has a similar look to our extremely popular PE-90-D.
Talking through the installation with our customer revealed he wants the perfect setup for dependability and flexibility. So without a doubt that means both an ac pump and a dc pump. The dc side is easy; again we’re back to the Rule 3700 as it’s the only dc unit large enough to handle this size of tank. The ac side has more options and we’re yet to finalize the decision. For years it’s been standard on big rigs to use pool pumps. 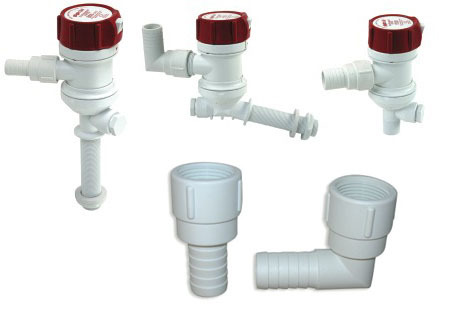 There are a huge variety to select from, most with built in strainers and non-corrosive housings. We’ve used the Whisper Flo pumps with good success. They’re very quiet and even the 1/2-hp size moves an astonishing amount of water, so much in fact we usually install a bypass to dump the excess. But one of the downsides is they are physically large…you’ll need some space to mount them. 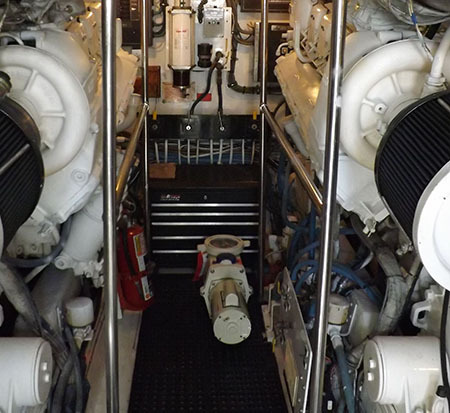 Big ac pumps need space and the engine room on this 65′ Hatteras has it. On many of our installations we use custom ac pumps tailor-made to our specific needs. The actual size of the pump is smaller as we use a separate sea strainer. The pump housing and impeller are made of bronze and coupled to high grade motor you’ve got a unit that will last for years. The only downside is the cost, which can be upwards of a $1000; but for those who want the best it’s a small price to pay. The pump is the heart of your bait system and with some basic care and maintenance most will provide a long service life. 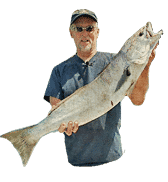 Their job is to circulate the water in your tank to keep your bait healthy and happy and ready to do their duty…helping you to catch more fish!! !